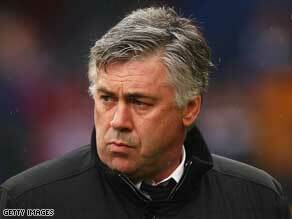 LONDON, England (CNN) -- Italian football manager Carlo Ancelotti has gone from Milan to London in less than a day. Carlo Ancelotti will take over as manager of Chelsea from July 1 this year. Just 24 hours after resigning from his highly-successful eight-year stint at Italy's AC Milan, he has been announced as the new manager of English Premier League club Chelsea -- replacing temporary manager Guus Hiddink. Chelsea, who won the FA Cup at the weekend, were looking for a permanent manager for the start of next season -- and Ancelotti has been signed on a three-year deal to the west-London club. A statement on Chelsea's web site read: "Carlo was the outstanding candidate for the job. He has proved over a long period his ability to build teams that challenged for, and have been successful in, major domestic and European competitions." Ancelotti, who turns 50 next week, has been in management since 1995, when he took charge of Italian Serie B club Reggiana. Although he only spent one season at Reggiana, he managed to earn them promotion to the top-flight Serie A league. Since then he has managed Parma and Juventus, before taking on the San Siro-based giants AC Milan. Is Ancelotti's appointment the right move for Chelsea? Tell us in the Sound Off box below. As a manager he has enjoyed plenty of success, particularly in his time at the Rossoneri. He steered Milan to the Coppa Italia in 2003, the Serie A title in 2003--04, the UEFA Champions League in both 2002--03 and 2006--07, the UEFA Super Cup in 2003 and 2007 and the FIFA Club World Cup crown in 2007. Before entering management, Ancelotti had a significant playing career as a midfielder with AS Roma and AC Milan. During his time at both clubs he amassed three Serie A titles, two European Cups, and he also won the Coppa Italia four times with Roma. He is one of only six people to ever win the Champions League as both a player and manager -- a list which includes current Barcelona manager and this year's winner, Josep Guardiola. Ancelotti also represented Italy on 26 occasions, scoring once. He played in the 1986 and 1990 World Cups alongside players such as Roberto Mancini and the recently-retired Paolo Maldini. Despite his management success at AC Milan, it has been widely reported that his relationship with the club's owner, Silvio Berlusconi, has not been strong in 2009. He takes over at Chelsea as the permanent replacement for Luiz Felipe Scolari, although Guus Hiddink has been in charge since Scolari was sacked from Stamford Bridge in February.